Reed Lodge at Wood Fen Lodges in Little Downham, near Ely sleeps 4 people. Wood Fen Lodges near Ely are nestled in beautiful, open Cambridgeshire countryside; Wood Fen Lodges have been thoughtfully converted and decorated to provide all the home comforts that discerning guests need for a relaxing getaway. 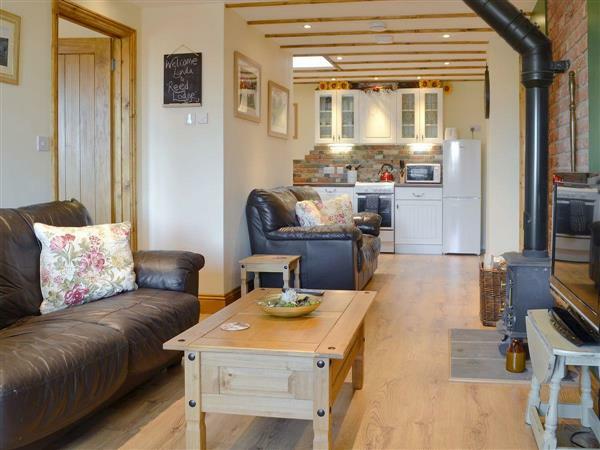 In a quiet location with exposed beams, cosy wood burner and private use of a hot tub (by arrangement), there really is nothing more you could need for a perfect break. Some guests may choose not to venture far, instead deciding to relax in their private garden, or perhaps book themselves in for a spa treatment at the on-site spa (at cost), where refreshments are also available. Bustling Newmarket is close by and offers a famous racecourse which often hosts musical entertainment evenings. For breathtaking countryside, visit Thetford Forest with its numerous walks and cycle routes, and its Go Ape centre, featuring tree walks, zip wires and Tarzan swings. And, after all your adventures, you can head back to Wood Fen Lodges, unwind, relax (perhaps in the hot tub?) and dream of places yet to see. Just perfect! The shop is 1 mile from Wood Fen Lodges near Ely, with the pub and restaurant 2 miles. Property refs UKC563 and UKC564 [Sedge Lodge] can be booked together to sleep 10 people. Living room: With wood burner, 38 Freeview TV, DVD player and laminate floor. Conservatory/dining area: With laminate floor and French doors. Kitchen: With gas cooker, microwave, fridge/freezer, dishwasher, washing machine and laminate floor. Gas central heating, electricity, bed linen, towels and Wi-Fi included. Welcome pack. Enclosed garden with patio and garden furniture. Shared 4-acre unspoilt grounds. Use of hot tub (restricted times, subject to availability). Bike store. Parking for 2 cars. No smoking. Please note: There is an unfenced lake in the grounds, 150 yards. Both properties: LPG central heating, LPG, electricity, bed linen, towels and Wi-Fi included. Initial logs for wood burner included. Welcome pack. Enclosed garden with patio and garden furniture. Shared 4-acre natural grounds. Private use of hot tub by arrangement, subject to availability. Bike store. Parking for 2 cars. No smoking. Please note: There is an unfenced lake in the grounds, 150 yards. Holidays at Reed Lodge, Wood Fen Lodges run from Friday to Friday. Pets allowed at Wood Fen Lodges - Reed Lodge. For a better idea of where Wood Fen Lodges - Reed Lodge is, you can see Wood Fen Lodges - Reed Lodge on the map below. Wood Fen Lodges - Reed Lodge is in Cambridgeshire; should you be on the lookout for a special offer, you can find all the special offers in Cambridgeshire. It's always worth checking to see what is on offer at the moment. Do you want to holiday near Wood Fen Lodges - Reed Lodge (UKC563), you can see other cottages within 25 miles of Wood Fen Lodges - Reed Lodge; have a look to find your perfect holiday location.